Fourteen acres means A LOT of pumpkins to choose from. There's a pumpkin for everyone. Go before you go. There are no “facilities” in the pumpkin patch. Line up for the hay wagon ride tin the barnyard. The hayrides run continuously from 10 am to 5 pm on Saturdays and Sundays. No reservations are needed. The entire experience—the ride, picking a pumpkin, and returning to the farm—takes approximately 30 minutes. However, on busy Saturday and Sunday afternoons in October there may be a waiting line. Sorry, we cannot fit strollers or kid wagons on the hayride wagon. We provide wagons and wheelbarrows for you to haul your pumpkins and other purchases to your car when you’re ready to leave. 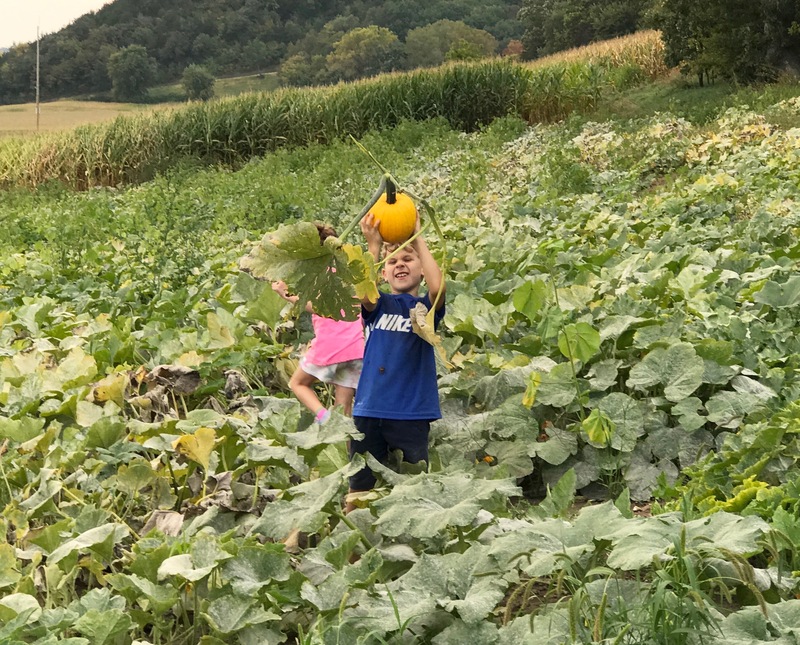 We also have pumpkin valet service provided by our younger relatives–they’ll haul your pumpkins out to the parking lot for you, and then bring the empty wagon back to the farm. We provide free pumpkin daycare if you aren’t ready to leave the farm but want your pumpkins to be safe and happy. Everyone must carry their own pumpkin! Choose a pumpkin that you can carry to the hay wagon without hurting yourself. Lift with your legs, not your back. Wipe off water and mud. The pumpkin patch can be muddy after a rain. We carry rags to wipe any slipperiness off your pumpkins. Keep one hand under the pumpkin’s bottom. Lift and carry it from the bottom, not by the stem. Do not roll the pumpkin on the ground. It may have a hard shell, but you don’t want to risk damaging it by grinding dirt or gravel into its skin. Check your pumpkin for soft spots that can indicate rot. Your pumpkin can last all month if you’re careful. Keep it in a the shade, and move to a cool place, like a garage or basement if gets very hot outside. Protect it from frost, as a hard frost can damage the surface and invite rot. Have a pattern in mind? Bring it with you to find the right pumpkin to fit it. Make your carved pumpkin last longer. Molds and bacteria make your pumpkin rot, so disinfect the surface before you carve. Wash your pumpkin in a mild bleach solution and then dry before carving. Use clean carving tools. Make it last even longer. Carved pumpkins dry out and collapse eventually. Revive your pumpkin by placing it a bucket of water (or a garbage bag with water) for a few hours. Don’t carve until you are ready to display it. Keep it out of extreme heat and protect from frost. Power tools make carving big pumpkins much easier. Follow Angie’s board Treinen Farm Pumpkin Decorating and Carving Ideas on Pinterest. Every kid needs a real pumpkin! Visit the friendly farm animals! Any pumpkin can be carved, painted, or cooked. If you are looking for a special pumpkin pie pumpkin, check out the produce area of Treinen Farm, where we offer pumpkins with abundant sweet flesh, as well as pumpkins grown specifically to produce great seeds for roasting. For thousands of years, people have been scooping out gourds, turnips, beets, and potatoes, and putting candles inside them to use as lanterns. In the British Isles, the flickering lights of the lanterns reminded people of the ghostly lights that hovered at over peat bogs and marshes at night. The people called the lights will-o’-the-wisp, pixie light, friar’s lantern, hinkypunk, corpse candle, hobby lantern, rolling fire, fool’s fire, and jack-o’-lantern. British immigrants to America brought their customs with them. All Hallows Eve became Halloween, and pumpkins became the vegetable of choice for carving jack-o’-lanterns. Today’s trick-or-treaters don’t carry real grinning jack-o’-lanterns from door to door, but they are often greeted by their glowing apparitions on their neighbors’ porches, carved into scary faces, cheerful faces, funny faces, movie stars, presidential candidates, symbols, logos… And we still put lights inside them.